Visiting Exhibition: "Raymond Dabb Yelland: California Landscape Painter"
Raymond Dabb Yelland: California Landscape Painter is the first exhibition in more than 50 years to celebrate the life and work of this important 19th-century artist. From Yelland’s arrival in Oakland in 1873 until his death in 1900, he rendered beautiful views of West Coast scenery, incorporating changing fashions of landscape art into paintings that retain credibility as depictions of real places. Raymond Dabb Yelland, Sunset, Golden Gate, n.d. Oil on canvas, 28 x 48 in. Collection of Fred E. Keeler III. Yelland (1848 – 1900) became noted early in his career for quiet coastal scenes in a variation of the Hudson River School style, known today as Luminism. Along with prominent Eastern artists such as John F. Kensett, Yelland explored harmonies created by light reflected in atmosphere. Paintings like Point Bonita from Point Lobos (below) contrast the sunset warmth of the headlands with the cool blue of the ocean. As the orange and blue tones recede into the distance, they become attenuated in harmonious gradations, adding to the serenity of the painting and constituting much of its emotional appeal. The delicate, cottony waves slide into the shore in a peaceful manner, adding to the tranquil mood. Raymond Dabb Yelland, Point Bonita from Point Lobos, n.d. Oil on canvas, 18 x 30 in. Collection of Roger and Kathy Carter. Coast scenes were only one aspect of Yelland’s repertoire. His trips to Oregon and Yosemite inspired depictions of mountain scenery that competed with similar paintings by Thomas Hill and Albert Bierstadt. Although out of fashion in the eastern United States by 1880, paintings of grand subjects like these were still appreciated in California. 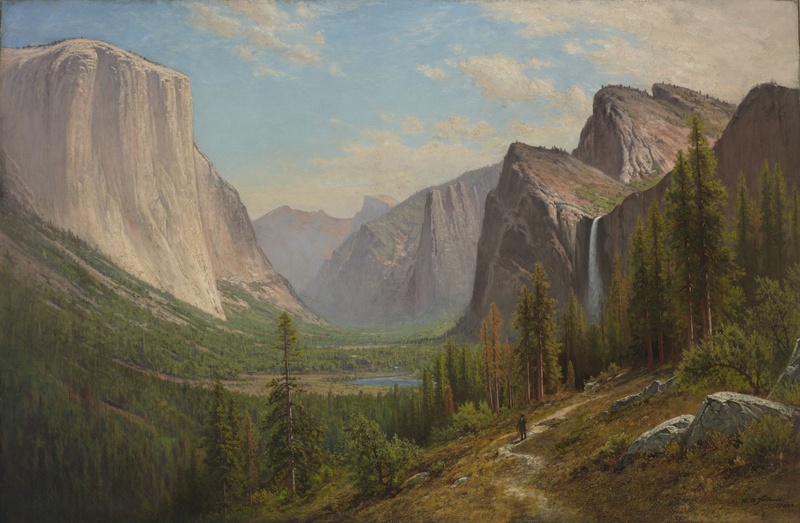 In 1885, Yelland exhibited Yosemite Valley (top of the page), which received a mixed reception from an up-to-date San Francisco Chronicle critic: “The day for painting Yosemite pictures is over,” he sneered, “Mr. Yelland’s picture, with all its acknowledged cleverness is unsatisfactory and untimely.” Today, when the timeliness of 19th-century fashions seem less relevant, we can enjoy Yelland’s picture for its power and beauty. And, although it depicts a familiar subject, it nevertheless projects Yelland’s personality in subtle ways, particularly in the inconspicuous red accents scattered throughout the composition. This unifying element combined with Yelland’s distinctive brushstrokes result in the creation of a work of art, not a colored photograph. Raymond Dabb Yelland, Alameda Lowlands, n.d. Oil on canvas, 32 x 48 in. Collection of Fred E. Keeler III. In the 1880s, as the French Barbizon aesthetic replaced the Hudson River School style of painting, Yelland increasingly painted humble subjects in a more loosely handled, intimate style made popular by the French painters. Artist James Whistler’s influence is also apparent in Yelland’s later works. Whistler advocated coordinating the color scheme of a painting into “harmonies,” a strategy that can be seen in many Yelland landscapes of the 1890s. In Where Sluggish Tides Creep In (below), various green and gray tones produce hypnotic beauty out of a credible depiction of nature. Mystery is introduced in the distant sailboat and building, which are reduced to pale visions by intervening atmosphere. Raymond Dabb Yelland, Where Sluggish Tides Creep In, 1894. Oil on canvas, 20 x 30 in. Collection of Eleanor and Richard Johns. Despite responding to mainstream trends in landscape art, Yelland was essentially a realist. “Conscientious” was the adjective often used to describe his art — sometimes with a laudatory tone, but oftentimes with a negative connotation. Yelland responded to his critics, “Art is not an imitation of nature as much as the expression of one’s own feeling.” Much of Yelland’s “feeling” has to do with the scenes he portrayed, from placid coastal views to grand snow-capped mountains. Regardless of his subject matter, his ability to mimic reality in paint was remarkable, and it is in large part the believability of his fictions that provides his work with such strong emotional appeal. - By Alfred C. Harrison Jr.
Raymond Dabb Yelland: California Landscape Painter is on view at the Crocker Art Museum from October 28, 2018, to January 27, 2019. Cover image: Raymond Dabb Yelland, Yosemite Valley, 1885. Oil on canvas, 40 x 60 in. Collection of Roger and Kathy Carter.